Fields beat Daman to clinch title. We met up knowing that victory would crown us league champions, defeat would leave us dependant upon the results of other games. The toss was won by LFCC and Daman were inserted. Ball regularly beat the bat and catch went down of Phil Clark and in the process his finger was dislocated. He carried on manfully and bowled a fantastic spell with Upendra at the other end chipping away wickets. Little did Daman know that Troy Utz however was waiting in the wings, his taster over bowled whilst Phil was off proved useful as a yorker/full toss was spooned to Mid On. However in the blink of an eye Utz had 5 wickets to his name and were taking 20 Over drinks with 8 batsmen back in the shed. First ball however after drinks last one of the Over Try suddenly had a 6fer as a good delivery was clipped nicely off the pads only to find yours truly at Square Leg diving to his left. The end was soon nigh and Daman had set a score of 89 to beat in 40 Overs. The run chases started as poorly as one could have not hoped for from an LFCC perspective, as Alex Turner was run out without facing. But then the next 10 Overs VJ dispactched all bowlers to all parts as a rapid 60* and Robin Friend 20* saw LFCC home with 9 wickets and 29 overs to spare. Pacific CC finished their debut season in the North East London League in style as they blew away a youthful Stoke Newington XI. Having won the toss and elected to bat, Stokey were unable to contain Pacific's opening seam duo of Custard and Stockton, as the former took three wickets for only four runs off three overs. 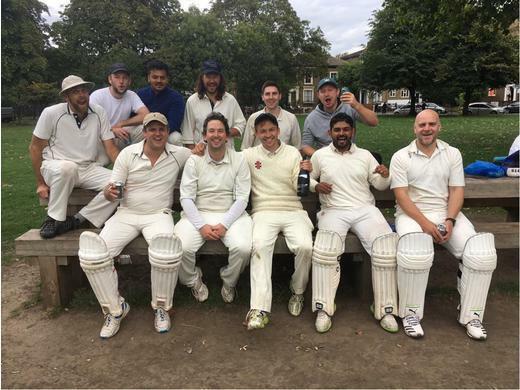 With the scoreboard reading 16/5after only six overs, Pacific then turned to their part time bowlers to provide the batting side with 46 extras – comprising more runs than Stoke Newington's top-scoring pair combined and dragging the home team to a respectable 129 all out. After tea, Stoke Newington's opening pair bowled tightly, restricting opening batsman Dempsey to a hard-fought 18 from 31 deliveries. Seamer Makim impressed as he snared the key wickets of Digby (6) and Chasseaud (11) for cheap, although any hope of a famous victory was soon extinguished by Pacific number four batsman Blake, who smashed an effortless 45 at a strike rate of over 200 to take the game away from the hosts. Pacific's strong middle order proceeded to close out the match and their NELL season in leisurely fashion. The Ocean's XI now find themselves in eighth position, tied on points with Clapton & Oval, who have a final game in hand. Stoke Newington remain rooted to the foot of the table. The final match of the season for both teams had a festive and care free atmosphere under cloudy skies. Clapton won the toss and elected to bat, with openers Amir and Younus wasting no time in setting a rapid scoring rate, rushing to 79 from the first 10 overs before getting to 136 for 1 at drinks. A hundred for Amir anchored the innings and Clapton finished their 40 overs on 278 for 4. With an imposing score to chase, The Camel made a solid start getting to 64 for no loss at 9 overs before wickets started to fall in clumps at regular intervals, finally being bowled out for 185 in 32 overs. A Clapton victory finishing a topsy-turvy but always enjoyable season.